It is Thursday and after a two weeks break from the blog I should be posting another recipe… But I won’t. I need to figure out how to continue this blog (and still stay sane :-)). I’ve reached an amount of recipes now that I am quite happy with and I keep baking and making quite a few of them… But I’m not sure I want to keep creating more, just for the sake of it… So be patient and enjoy this inspiring picture of my lunch today, for now. Made a fresh salad from “Feldsalat” (Cornsalad / Valerianella), “Baerlauch” (Wild garlic / Ramsons) and mint leaves / mentha. 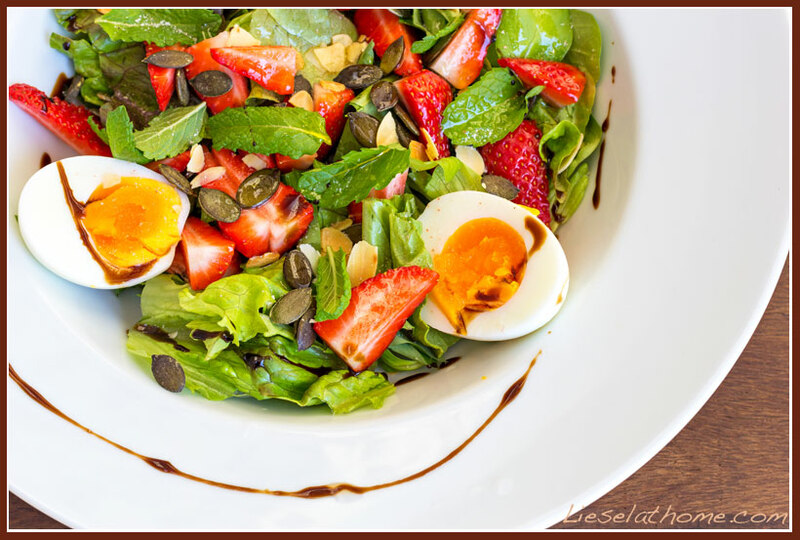 Topped with strawberries, eggs, pumpkin seeds and almond flakes. Sprinkled with olive oil, balsamic vinegar and salt. And voila – Suddenly noticed my salad was smiling at me!